It is no secret that the Okanagan is home to British Columbia’s best wineries. Why not slow down this weekend and go on a getaway to experience the timeless world of winemaking? With spectacular views of the Okanagan Lake, these wineries must be at the top of your to-do list! You can spend all weekend winery hopping, but Mission Hill Winery and Quails’ Gate Estate Winery are the ones you can easily spend an entire day. Located in West Kelowna and only a few minutes’ drive from each other, both wineries offer a one-of-a-kind experience. Whether you’re a connoisseur or are new to the art of wine, there is plenty for you to enjoy. Pack your bags and get ready for an unforgettable weekend! From the moment you pass through the enormous gates into Mission Hill life seems to slow down and you instantly feel like you have entered into an exclusive estate. The grounds are impeccably manicured with the vineyard on display right at the entrance. Follow the path through the contemporary archway into the inner courtyard and take in the 12-storey bell tower that is the centerpiece of the piazza. The spectacular architecture designed by architect Tom Kundig of Olson Kundig Architects gives a nod to tradition without crossing the line. Don’t be surprised if you suddenly think that you are in Italy! Enjoy the views overlooking rows of Chardonnay and Pinot Noir while sipping a glass of wine and grabbing a bite to eat at the outdoor Terrace Restaurant. The fresh produce is mostly grown in the estate Varietal Garden! When you are done, find your way past the fountain and into the wine boutique. You can easily spend hours at the tasting bar and admiring the thoughtful product displays here! For those who want a complete wine country experience, we suggest taking one of the many tours and experiences that Mission Hill offers. 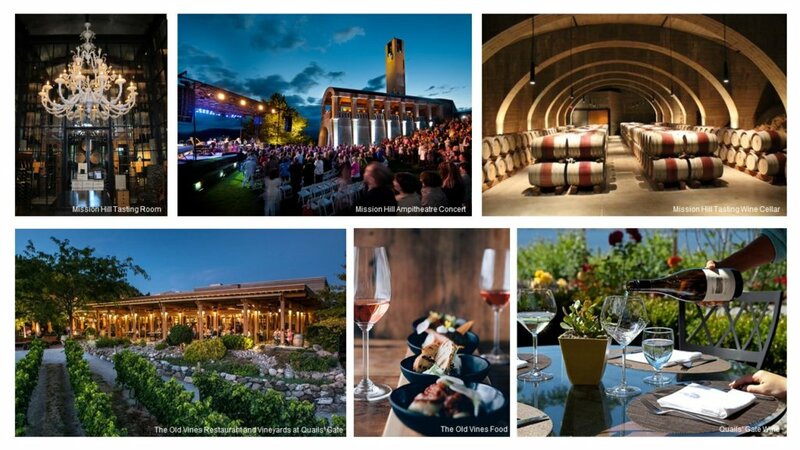 If you plan ahead you might also be able to snag a hot ticket to one of the concerts held in the winery’s ampitheatre for an unforgettable night filled with delicious cuisine, wine and music. With equally stunning views of Okanagan Lake is Quails’ Gate. For a true taste of the Okanagan, a meal at the Old Vines Restaurant is a must. It is renowned as one of the top 100 restaurants in Canada and is definitely worth the visit. Reserve a table on the terrace and enjoy your lunch or dinner in the vineyard setting with your glasses of wine. The tasting and tour options are also very educational. How about giving the Chocolate & Wine Tasting a try? It is sure to be delightful! We also love that Quails’ Gate offers two complimentary wines at their Wine Bar Tasting in the Wine Shop. We highly recommend tasting the Riesling Icewine and taking a bottle home with you! If you have an extensive budget and want to splurge for the weekend with a bunch of friends, you can even rent out The Lake House at Quails’ Gate. It is nestled at the bottom of the vineyards and has amenities such as multiple patios, a hot tub, gas fire pit and a chef’s dream kitchen. It will without a doubt be a weekend to remember!